The 2 most common grass types you will encounter on your properties in Central Florida are St. Augustine and Bahia. Both grass types have advantages and disadvantages and with recent developments at State level it would seem that St. Augustine has had its day. Other cultivars are likely to be adopted together with drought landscaping, but more on that later. Bahia grass is really the most suitable grass type for the Central Florida area, but unfortunately it doesn’t look as nice as St Augustine! The advantages are that it does well on sandy soil, can cope with drought conditions, has very few insect problems and establishes well from sod. Bahia seed is also available but is not suitable for most soil types in this area. This grass type also needs very little in the way of fertilizer but irrigation and some fertilizer together will keep it looking good. The disadvantages with this cultivar is that it doesn’t like shade that much, it forms tall seed heads between May and November and will grow quickly in between mowing visits. Weed encroachment is also something to keep an eye on but can usually be controlled . Since most of us are stuck with the St. Augustine grass type, the advantages are that it looks very nice and is easily established from sod. The disadvantages are that it needs a terrific amount of costly maintenance both in fertilizer, insecticide and water (especially in Polk county)! It is also a grass type that is most susceptible to insect damage, (the most famous of which is the chinch bug), cold weather and drought conditions. 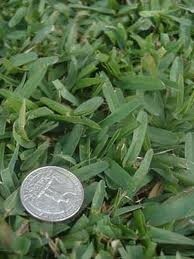 St. Augustine grass should generally be cut at around 4 inches, with sharp blades. But there are no real hard and fast rules about this as prevailing weather and yard conditions should determine a suitable mowing height. Repeatedly mowing at lower heights increases the stress on the lawn, discourages deep rooting, increases the chance of scalping and it may increase susceptibility to pest problems. Cutting at low heights in winter will expose the root systems to cold temperatures and frost damage. Maintaining the correct mowing height will help the grass to develop and protect the root system from sun and frost, which will give a better all round appearance to your turf. As a general rule, no more than a 1/3 of the leaf blades should be removed at any mowing event. 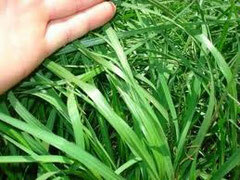 The clippings should be left on the yard as these provide extra nutrients to the grass. Excessive thatch or clippings should be removed as this will not be beneficial. Yards should not be cut during or after heavy rain as mowers will damage the grass and in general any maintenance will create a mess that will be very difficult and costly to clean up.